manofacoustics | Making rooms sound good. So Just What Is An Acoustical Analysis? An acoustical analysis provides very detailed and useful information about an acoustical space, such as your mix room, control room, live recording room, or screening theater. Multiple test measurements are performed in multiple positions in your room and recorded in a computer. This raw data is then manipulated by the software to provide plots and graphs that reveal a treasure trove of information. These measurements precisely identify characteristics that sabotage the sound quality of your space. In addition to disclosing data on obvious problems, a room analysis can also reveal issues that happen at a level where perhaps you can’t hear them, but you can detect their resulting effects. It also reveals problems that are masked by other sound. Extended mode decays, early reflection artifacts, and air conditioning rumble are examples of these that I frequently see. But nothing can hide from a good room analysis. It is an excellent tool to pinpoint issues like these, and is the tool of choice to provide you with direction when upgrading the acoustical performance of a room. It yields pinpoint data to show exactly where treatment is needed, but equally important where it is not needed. In addition to having a more accurate and good sounding room, this helps you to make the most effective use of your budget. As mentioned in Sound Absorbers’ Dirty Secret, there is another type of absorber, which is particularly well suited for low frequency applications. This is the Helmholtz resonator, named after Hermann von Helmholtz, the fine German fellow who invented the modern version of it. He also gave us lots of devices and discoveries in other areas as well. Quite a renaissance man! The incarnation of his resonator that is most useful to sound folks is a simple rigid box with a hole in it (known as the “port”). If you built a ported speaker cabinet without cutting holes for the speakers, you would have a Helmholtz resonator. The absorbers I spoke of previously are called resistive absorbers, where the kinetic energy of air particles in motion is changed into heat by the material resisting their movement. The Helmholtz resonator is what is called a volumetric absorber, where the internal volume interacts with the port to absorb sound around a certain frequency. This frequency is determined by the relationship of the internal volume of the box to the size of the port. Now we turn the tables around. Since this is a volumetric absorber, what matters most is the internal volume, or size, of the resonator. The shape has virtually no influence on the absorption. Unlike my previous blog post on room shape, where we’re adjusting the dimensions to change the relationship between the room resonances, what we’re interested in here is just the cubic volume of the box. So this gives us a particularly handy property that makes them easy to implement. Since shape doesn’t matter, you can make them into any shape you want. That allows you to make them fit into spaces that might otherwise be wasted, like under a console meter bridge, under a desk, or even built into a speaker wall below the speakers. They still work just fine; let your imagination run wild. Once you figure out the size you want, you adjust the port size to tune it to the desired frequency. The Helmholtz resonator is handy for another reason. When you get into the low frequencies (below ~300 Hz. ), you enter a region where the variations in level between resonant frequencies are usually their greatest. This is because the room resonances are at their fewest, resulting in both large gaps between resonances, as well as resonances piling up around one frequency (see the “Shape Matters” post). This gives you peaks and dips in the response that are responsible for significant coloration of the room’s sound. So in this region it is actually counterproductive to absorb a broad range of frequencies like the resistive absorbers. A broadband absorber in this region will absorb at the frequency peaks like we want, but it also absorbs the dips we don’t want to make deeper. This is like a bass tone control that turns EVERYTHING down. But what we really want to do is reduce the peaks while preserving everything else, so that we’re smoothing out the frequency response. This why I have a strong preference to use resonators rather than bass traps in critical listen spaces. By smoothing out the response in this region, where a lot of a room’s coloration occurs, you’re making critical progress in having a “neutral sound” in your room. So now I bet you’ve made the connection between resonators and the good sound they can provide. If you can identify the frequencies of the troublesome room resonances, you can build resonators tuned to those frequencies to smooth out the response. And that makes your room sound better. When it comes to building an acoustically sensitive room, like a mix room or a live recording space, I always like to be brought in to consult at the very beginning of the project. This allows me to give input regarding site location (like avoiding a location next to a cement plant or rail road tracks), and check the site out for other issues that may impact how well the facility works. But the most important reason for me to join a project at the same time as the architect is because the shape of the room, and the relationship of the three dimensions in particular, is the single most important factor in attaining a good sonic quality when the room is completed. I like to say that once you get the shape of the room right, you almost have to work hard to make it sound bad. First, I start with a rectangular room. Parallel surfaces, right angles, the whole thing. Some people recoil at the thought of this, citing the “rule” that you don’t want parallel walls (they cause flutter echoes). But what you gain from having a rectangular room with parallel walls far outweighs what you sacrifice. In every enclosed space there is a specific resonant frequency for every dimension. (These resonances are also known as “room modes” or “eigentones”.) So in a room with, say, non-parallel side walls (“splayed walls”), every different dimension between these two walls has a different resonant frequency. That means that as you walk from the wider end to the narrower end, all the resonant frequencies will shift up from their lowest at the wide end to their highest at the narrow end. In practice, this does two things. First, it adds a very substantial level of variability to the room, so that the sound quality or timbre will change as you move around the room. Second, it makes calculating the frequency and location of the room modes nearly impossible, so the devices used to address the room resonances won’t be very effective. On the other hand, in a rectangular room, it is very easy to calculate the frequency and location of the room resonances. They are predictable, their frequencies and locations are easy to calculate, and the frequencies don’t shift as you move around the room. What you get in return for this is greater sonic consistency and substantially less variation in timbre as you move around the room. This makes it a lot easier to do your mixing, playing, or listening. And you are much more likely to be confident that what you hear is what’s “on tape”. If you have clients, working with them will be easier because everyone is hearing much closer to the same thing. Meanwhile it’s easy to deal with any flutter echo with simple wall treatments like diffusors or absorbers. But the coloration, increased variation and unpredictability that come from shifting dimensions can’t be fixed. Band aided, maybe, but not fixed. Not with EQ, not with absorption, not with anything. The variation will always be there. Now that we have chosen a rectangular room, the question becomes “what should the dimensions be?” Designing a good sounding room doesn’t have to be a hit-or-miss affair; it requires close examination of the room resonances. For good acoustics, selecting the width, length and height is a lot more than making the best use of the available space and designing a nice interior layout. To end up with a good sounding room, the most important thing is to adjust the three dimensions during the design phase so that ALL the room resonances are distributed as evenly as possible in the frequency . This is done by selecting three room dimensions that work with the space available, calculating all the resonances for each dimension, and then tabulating them by ascending frequency. The goal is to get the differences between the frequencies as even as possible. Ratios that are whole numbers should be avoided, as they are exactly what you’re trying to get away from. Sometimes two or more resonances will pile up around one frequency, which happens with whole number ratios. This should be avoided, because this creates coloration in the room timbre. Likewise, if there is a large gap on both sides of a resonance you’ll end up with coloration there as well. Your first calculation will have some obvious problems, so the next step is to change one of the dimensions and perform another calculation. And again. And yet again. Keep repeating the calculation until you have dimensions that provide as even a distribution as you can get. There will be some limitations on what dimensions you can use, such as a room height that can’t change or a room length that is set in stone. You also don’t want to use dimensions that will make your room uncomfortably narrow, leave you with an oppressively low ceiling, or otherwise make the room uncomfortable to be in. While this limits the solutions available to you, it also limits the number of calculations you have to make, so it’s easier on you. So now you’ve settled on a rectangular room, which your builder and accountant will like, and you’ve selected dimensions that have the smoothest distribution of resonances. You’ve just gone most of the way to getting a room that will sound good. As I said, once you get the dimensions right, you almost have to work to make the room sound bad. I’ve tried using dimensions from a successful room and scaling them for another room of a different size. But when I ran calculations with these new dimensions, I found it didn’t produce the even distribution of resonances that I thought it would. I found two reasons for this. First, going larger or smaller changes the distribution of resonances so that some may get too far apart, and some may get too close. Second, calculating the resonant frequencies involves a non-linear mathematical function that renders a linear scaling inappropriate. So yes, you have to do the entire calculation exercise with every different room. It is common thinking, even among some seasoned sound professionals, that sound absorbers reduce the overall level of sound energy equally across the entire audio spectrum. This idea has led many well-intended – but uninformed – people down the path of making mistakes when trying to improve the “sound” in an acoustical environment. If they’re lucky, they’ve stumbled on something that works, but not because it was planned that way. If they’re not lucky, they’ve actually degraded the room’s sound. The importance of good acoustics is simple. Whether you’re cutting effects or dialog for television, recording and mixing your own music in a home studio, or mixing feature films at a major facility, you’re making level, equalization, and other adjustments based on what you’re hearing. You need to be confident that your room acoustics aren’t skewing your judgment by coloring what you’re hearing. Every track is going to sound a little different when it’s played in different rooms. But if you’ve worked on your tracks in an acoustically neutral space, you maximize the chance that other people will hear your work in their rooms as you intended it to sound. This is particularly important when working on highly collaborative projects like feature films or TV shows. Sound absorption is the best known acoustical treatment. In fact, for many people it is the only acoustical treatment they know of. This makes it the most used, and, alas, most misused acoustical treatment. There are a number of attributes that sound absorbers have which few people understand. The attribute that is the least understood and the most likely to damage a room’s sound is what I call a sound absorber’s dirty little secret. This dirty little secret is that they don’t absorb all frequencies equally. And that means they’re not performing the way we think they are and may be working against the neutral acoustics we’re looking for, unless they are properly selected and installed. This isn’t to say sound absorption is bad, it is in fact a crucial part of treating a room. But it needs to be done right, and to use it right, you need to understand it. For any given absorber, there is a point somewhere in the low end of the audio spectrum where their absorption rolls off. To look at it another way, as the frequency drops, so does the amount of absorption. So while absorbers are commonly thought of as level controls or attenuators, they are actually low pass filters. This means when we add absorption to a room, it may sound “deader” or less reverberant, but it also is duller. So this is the “dirty little secret” of sound absorbers – they don’t absorb all frequencies equally. Armed with this knowledge, we can now use the absorbers to our best advantage. My favorite sound absorber is 2 inch thick Owens-Corning 703 semi rigid fiberglass board. In its published performance specifications, it is nearly 100% absorbent from roughly 300 Hertz up. So if we need to take energy out of the room, perhaps because it is highly reverberant, we can do so with some 2 inch 703. But much of the coloration and early reflection problems occur below 300 Hertz. Since our favorite 2 inch 703 isn’t helping us in that region, we need another tool that works there. By using a second device, we can better tailor the entire frequency spectrum of the room. That is the Helmholtz Resonator (to be covered in another entry). By using a judicious combination of 703 and Helmholtz resonators, we can start approaching the overall “level reduction” we’re looking for. The fourth building block of acoustics is perhaps the most overlooked, which is vibration isolation. Even people with no interest in acoustics are familiar with the problems that come from poor vibration isolation. If you’ve ever shared a wall with another whose taste in entertainment is different, you’ve experienced the effects of transmission of sound energy through the physical structure of a building. This element breaks the physical connection between vibrating things and the structure of the room and building. Sound travels easily and efficiently through solid objects, so when speakers are sitting firmly on the floor or bolted to the wall, some of their sound energy travels through the speaker cabinet and into the physical structure of the room. This energy then easily transmits through the structure to other rooms. This is one of the reasons you hear the thump and rumble from a speaker system elsewhere in a building. And it’s also how the rumble of roof mounted air conditioning machinery or other spinning motors can intrude into a building. Vibration isolation is particularly important in a multi-room audio facility where each room needs to be free of intruding sound from other rooms. Or in a home theater where the sound can disturb others elsewhere in the house. And in a situation where you have live recording, it is important to keep this sound from intruding into the studio and being recorded by the open mic. This kind of sound transmission is best demonstrated by an executive toy called balance balls; for the more scientifically minded, this is also known as a Newton’s Cradle. There are five balls suspended in a row within a frame. If you lift a ball at one end of the line and release it, it hits the next ball which doesn’t move. Nor do the third or fourth ball. But the fifth/last ball flies out. Amazing! This is the law of conservation of energy and the law of momentum at work. A real-life example of your science class lessons at work. If you search “Newton’s Cradle” at wikipedia.org, you can get a full explanation, including an animation of it in action. So in our version of this, your speaker represents the lifting and release of the ball on one side, the wall framing that connects the two side of a wall equals the intermediate balls that don’t move, and the panel on the opposite side of the wall represents the ball at the other end flying out. Some of the energy from a vibrating speaker cone goes into the cabinet instead of the air, and from there it gets into the room structure through the solid connection between the speaker and the room structure. From there it can travel through all the framing and other physical structure to other rooms where it reemerges as disturbing thumps and rumbles. Remember that most walls are a panel of drywall screwed to a wood or steel frame, where the portion of a drywall panel between frame members is not restrained and is therefore free to vibrate. So when your speaker is on the floor, bolted to the wall, or otherwise attached to the room structure in one way or another (as it must), you also have a solid physical path for the energy from your speaker to get into the room’s structure. So how do we fix this situation? The perfect solution would be for the speaker to not touch anything. But until an antigravity device has been perfected, we’ll have to find another way. To solve this problem, we simply break the physical connection between the speaker and the room structure by supporting the speaker with something that doesn’t provide a path for the energy. One method that has been tried is to put your speaker on something very heavy, like a concrete block or cement slab. This is called an “inertia block”. The idea behind this is that the higher the mass, or weight, of an object, the more energy it takes to move it. This is true, but if you think about this in terms of Newton’s Cradle, it becomes apparent that this won’t work well at all. There is still a solid connection, and there is nothing to dissipate the energy. You still have the immutable laws of conservation of energy and conservation of momentum at work. The energy has to go somewhere (it doesn’t just “disappear”), so it transfers through the rigid inertia block just like any other solid. The block is acting like the middle balls in the Newton’s Cradle, passing the vibration energy to the room structure. So while you will get some small frictional losses, there won’t be anywhere enough to get you the isolation you’re looking for. Another common way to provide vibration isolation is to use something called “high loading”. That means the mass of the object is being supported on as small a footprint as possible. This is the concept behind the pointy cones you can put under your speakers, or the spikes under speakers or stands. This creates what I like to call a “high impedance interface”. The small footprint presents an interface that has a higher resistance to the transfer of energy. But energy still gets through, especially in the vertical plane. But the best solution is what’s called resilient isolation. Simply put, this is placing something squishy between your speaker and whatever is supporting it. It dissipates the sound energy as heat and motion, rather than allowing it to pass through to the supporting surface. Sounds simple, but it’s important that it’s done right or you won’t get the full benefit. The resilient isolator has to be able to squish in all three dimensions. This allows the supported speaker to vibrate without any solid connections that can provide flanking paths for the energy to bypass the isolator. The resilient isolator also can’t be flattened by the supporting load. It needs to suspend the speaker in the same way a shock absorber works on your car. If there isn’t enough load, and the absorber is at the top of its extension, it’s a pretty solid connection and road vibration can pass through. Similarly, if the shock absorber is completely compressed, it is again a solid connection that passes vibrations. So in practical terms this means you can’t do what I’ve seen done so many times. If you place your speaker on a big slab of something like a sheet of rubber, it doesn’t work well because it’s not compressed enough. But if you put it on small pieces of something squishy, it’s easier to make sure the isolators are properly compressed to the middle of their range of compression. And you’ll be adding the advantage of high loading as well. This means you have to match isolators to the weight of your speaker. The thickness, hardness, and number of isolators have to be selected so that the isolators are compressed to approximately half to two thirds of their original thickness. This means you should be able to tap the speaker and have it wiggle a little bit; this will give the range of motion in the isolator that allows it to dissipate all the vibrational energy. My preferred technique is to place each speaker on little hemispheres or dots of material, with an isolator more or less at each corner of the speaker bottom. This placement is then adjusted to make sure the speaker is sitting level. By far the best material to use for vibration isolation is a product called Sorbothane ™. It was designed for exactly this kind of use, and so it outperforms all other materials, like foam, neoprene, rubber, or springs. Note that in earthquake-prone areas it is a good idea to put some sort of well anchored non-rigid restraint on each speaker, like an earthquake strap. This will help keep your speaker from becoming a projectile during an earthquake, and do it in a way so that the restraint doesn’t make a path that flanks the isolators. So now you’ve (hopefully) read about all four building blocks of acoustics, and have a better understanding of how they all work. A good sounding listening space is not voodoo, it’s not black magic, and it’s not selling your soul to some minor deity for secret knowledge. Good acoustics is the application of science to manipulate what happens to sound in an enclosed space, resulting in an accurate, pleasing listening experience. In the last episode, we examined the role diffusion plays as an acoustical tool. 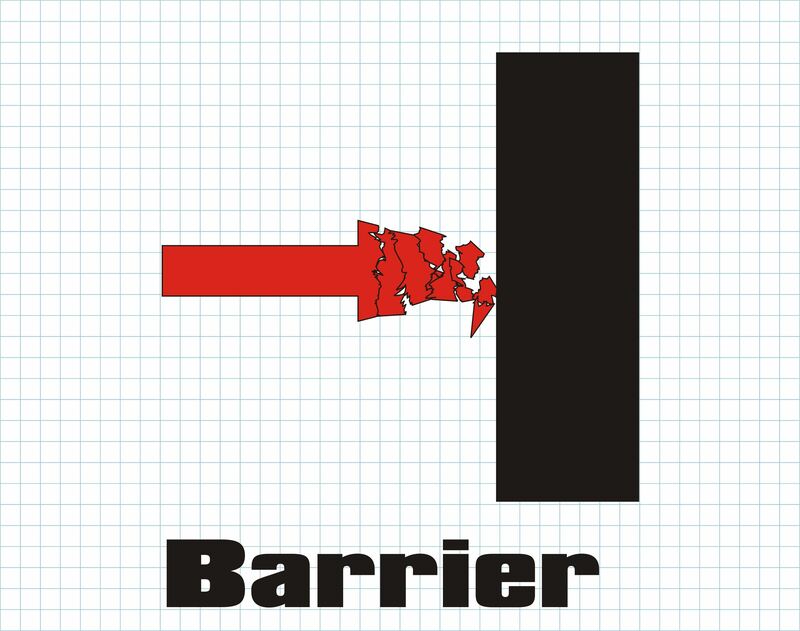 Today we’ll discuss barrier, or acoustical isolation. This is used to reduce or eliminate sound intruding from one space into another through the air. A prime example of this, for you film sound buffs, is when the sound from a mix stage (invariably mixing a heavy action film) finds its way into a Foley stage (invariably trying to record cloth movement). Now, some folks may think that since acoustical isolation doesn’t directly affect the perceived sound in a sonically sensitive space, it shouldn’t be considered an acoustical tool. I would say acoustical isolation is indeed pertinent, as when someone comes into your workspace complaining about how they can’t hear themselves think with all your “noise” going on. It very definitely affects the acoustics; it’s hard to hear the nuances of your mix over the yelling. Acoustical isolation is used to keep your pet project from becoming someone else’s noise, or being contaminated by that noisy S.O.B. in the next room. It’s about containment, it’s about courtesy, it’s about keeping that volatile person from doing bodily harm to you. Acoustical isolation can be incorporated into the walls and other surfaces of a room through good design and material selection. It can also be partitions or barriers added in the attic or in the crawl space under a floor to block flanking sound from traveling through those open spaces. The traditional way to block sound intrusion is with mass. This is a fancy way of saying the more something weighs, the more energy it takes to move it. And the more energy it takes to move something, the less sound it will transmit. This is why the really high end studios make walls out of cinder blocks filled with concrete. A lot of sound has to hit THAT wall to find its way into the next room. But very few of us can afford cinder block studios. So another popular acoustical isolation material is good old drywall. It’s got mass, it’s cheap, and there are a lot of skilled trades people who can work with it. Drywall is also very adaptable – you can you build up multiple layers to get more acoustical isolation, and use soundboard or resilient channel between layers. One of the most effective techniques used in large studios is building a second insulated wall with an airspace between the two. Taking this to its logical conclusion is the practice of building a “room within a room”. This provides the extra attenuation of double walls, as well as a double ceiling. It’s expensive, but when you’ve really got to keep your sound contained, this is a sure fire method. There’s also the “staggered stud” wall; a 2X6 plate and header with 2X4 studs. Each drywall sheet is not directly connected to the sheet(s) on the opposite wall through a stud, except through the plate and header. This removes a structural path where acoustical energy striking the drywall on one side is transmitted to the drywall on the other side (more on this in the next Acoustical Building Block). The “poor man’s” method of getting improved decoupling between each side of a wall is to install a second layer of drywall mounted on resilient channel. How well a wall or barrier attenuates sound trying to pass through it is referred to as its Sound Transmission Class, or STC. This is a number used to compare how well different walls, barriers and acoustical isolators work. So when you’re reading the STC’s for different thicknesses of drywall, mass loaded vinyl, or other materials/wall designs, this number gives you a common point of reference. But it is also easy to be fooled by this number. Every material transmits different frequencies at different levels, because of its characteristics at different wavelengths. So the STC gives you a useful single point of reference to compare, but if your acoustic space will have lots of low frequency sound, you’ll get far less perceived transmission loss than the number might lead you to think. Low frequencies are particularly important to pay attention to. Ask anyone who has been on the receiving end of sound intrusion, and they will tell you what bothers them most is the low frequency information, characterized by the words “thump” and “rumble”. If you’re working on a room that will have lots of low frequency sound, or has neighboring rooms that are sonically sensitive for any reason, it’s best to research what the actual numbers are by frequency band. That will give you a more accurate idea of what to expect in the low frequency area where you will need the most help. Most material manufacturers can provide this information; some, like Owens Corning, also have lots of other helpful acoustical information for you. Ok, so now you have the basics on absorption; now it’s time for the next tool – diffusion. When you add liquids in a bowl for a kitchen recipe, you usually stir it to get a smooth, consistent mixture. Likewise, in a listening environment, the sound should be well mixed and consistent, for two reasons. First, you want everyone there to hear the same thing, no matter where they’re sitting. Second, and more importantly, you don’t want your sound colored and distorted by rogue reflections. When sound leaves a speaker, it more or less radiates out in all directions within the room. Less so for the higher frequencies, but since sonic colorations in a room occur predominantly below 500 Hz. or so, this is our area of interest. Radiating out, it first reaches the listener with the direct sound; sound also strikes all the room’s surfaces and reflects towards the listener. When these early reflections reach the listener, they’re delayed slightly from the direct sound, due to the longer distance they must travel. You get two effects. First, the early reflections cause the apparent location of the sound to shift, since your ear is detecting sound coming from multiple sources. This creates a “smearing” of the sound and distorts localization. Everything moves around in subtle ways perceived more as an indistinct “bad sound”, than a specifically identifiable problem. Second, take two identical waveforms and mix them together. Delay one of them by a few milliseconds, and look at the resulting frequency response. You’ll see points where there are notches in the response, occurring at regular intervals. Looks kind of like a comb, right? That’s why this is called a comb filter effect. This is sonic coloration personified. There’s another issue. When you have two parallel surfaces in a room and generate a sound between them, you get this distinctive rapid, fluttery echo. This is best heard with an impulse, like snapping your fingers, and most often experienced in stairwells or hallways where hard walls face each other. More coloration! So diffusion is the acoustical tool that serves as our big kitchen spoon. It mixes everything so that what you hear in one position is essentially the same in other positions. And it breaks up the early, hard, specular reflections, the “angle of incidence equals angle of reflection” stuff you learned in high school physics. 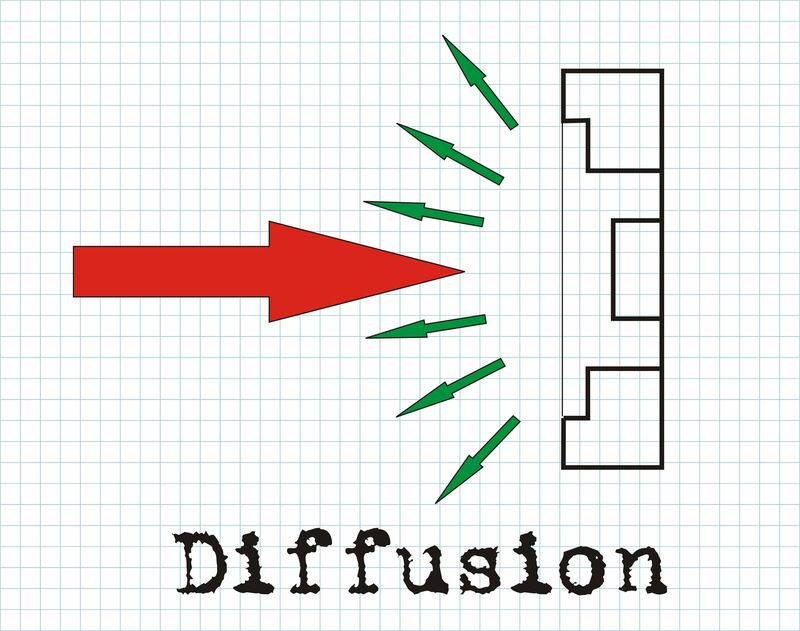 In my opinion, diffusion has the greatest affect on the actual sound quality in your room. When sound falls on a well designed diffusor, you don’t get hard, specular reflections. Instead, the reflected energy is broken into many smaller reflections, sent in many different directions. Unlike absorption, diffusion doesn’t remove energy, it spreads it around. So there’s also no turning up your level to accommodate losses, as with absorption. By placing diffusive elements at the points where the early audio reflects back to the mix position (which I call “critical reflection points”), the reflected energy is better distributed throughout the room. This breaks up the delayed sound that causes the comb filter effects, the smeared sound, the distorted localization, and the flutter echoes. And there’s an easy way to find these critical reflection points. Stand in the primary mixing position and have someone move a mirror on each side wall until you can see the speaker – that’s your critical reflection point. Repeat for all front speakers. By moving to the various listening positions and moving the mirror to see the speakers again, you will get a series of points. Install diffusion where it covers all these points. Repeat this for the other side wall, the rear wall, and the ceiling (harder to do, but very important). Now the big question is just what gives the best diffusion? A common misconception is that geometric protrusions provide the best diffusion. They’re OK, but not the best. If you do choose this route, your best bet is actually rectangular solids, rather than the odd shapes that are out there. You can also use polycylindrical, phase grid, primitive root, and perforated surface diffusors. But for the best performance, the most bang for your buck, use Quadratic Residue Diffusors. These are those strange looking devices that have rows of large slots of differing depths, like RPG sells. You can find them at a number of online resellers, but if you’re willing to do some math work, and you’re handy in the wood shop, you can design and build your own. So now you have a grasp of diffusion. There’s a lot more to know, so if you REALLY want to delve into the subject matter, get F. Alton Everest’s Master Handbook of Acoustics. You will learn a great deal, and find out that the mysteries of acoustics aren’t the “black magic” secrets they may have seemed.